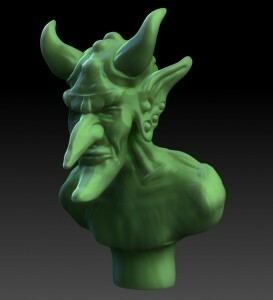 I’ve been playing with Zbrush for years and this year have done a number of commissions using it. In the 90’s when I started working in 3D animation I had dreams about software like this. Great to see Pixologic building tools for artists! I have started to record some of my sculpting sessions, here’s a recent one that I did in 40 minutes sped up to 2 minutes of a Goblin King. I used mostly the Move and ClayBuildup Brushes with the Transpose Tool on a Dynamesh. It’s like playing with clay!